1) Main Player Object: Drag and drop your main player’s game object here. 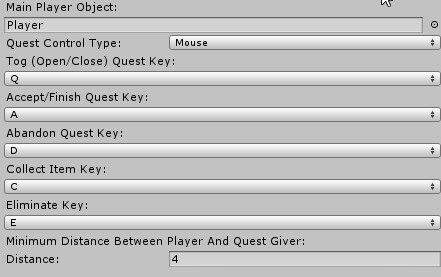 2) Control Type: You can choose the player will interact with quest givers by picking mouse, keyboard/joystick buttons or both at the same time. 3) Control Keys: If you choose the second or the third quest control type, then pick a key for each action. 4) Distance: Minimum distance between the player and the quest giver to interact with quest givers by clicking on them with the left mouse button. 5) Audio Clips: Played when the player accepts a quest, abandons a quest or finishes a quest. 6) Save and Load: Check this option if you’d like to save and load quest progress. It is a basic saving/loading system using player prefs. 7) Reset: Clicking on this button will reset all saved quest progress.